The case study described below provides an example of a situation where a significant change to the lateral position of the pedal can be an appropriate and effective option in achieving leg alignment and improved rider comfort. The case study concerns an experienced male cyclist, Mr. Peake, who was training between 12 and 15 hours per week. Mr. Peake had a left hip replacement approximately 12 years ago. Mr. Peake reported no major discomfort on the bike but had a general sense of “feeling a bit wonky” and described anterior hip impingement at the top of the pedal stroke. An ‘off-the-bike’ examination revealed a number of biomechanical challenges: severely restricted left hip internal rotation, asymmetry of the gluteal muscles, and left pelvis and shoulder anterior rotation. ‘On the bike’ our motion capture data showed that the rider’s position was in the normative range, except for a higher than normal back angle (approximately 60 degrees) and a left knee that tracked laterally (5-6cm at the top of the pedal stroke) – see the image below. Open the hip angle further by increasing the rider’s back angle and/or install a shorter crank. Move the left pedal laterally to bring the foot under the knee at the top of the pedal stroke. A third option of attempting to restore internal rotation in the left hip through rehabilitation was eliminated because given Mr. Peake’s medical history it was not thought to be a realistic goal. On consultation with Mr. Peake, option 1 was ruled out because the back angle was already overly upright given the rider’s goals, and secondly, because of the expense involved in changing cranks. 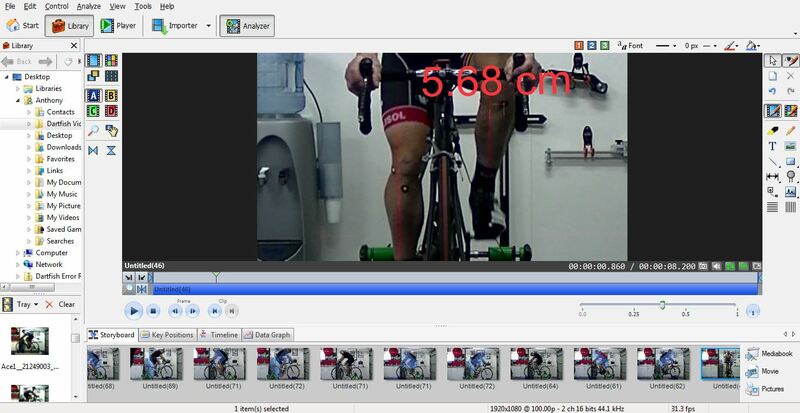 A 20mm pedal spacer was installed in the left pedal and the result can be seen in the motion analysis footage shown in the video below. On the left you can see the alignment of the leg through the pedal stroke, in particular the knee, without the pedal spacer. On the right, with the pedal spacer. The leg alignment on the right is significantly improved. Mr. Peake reported an immediate decrease in the amount of anterior hip impingement at the top of the pedal stroke. 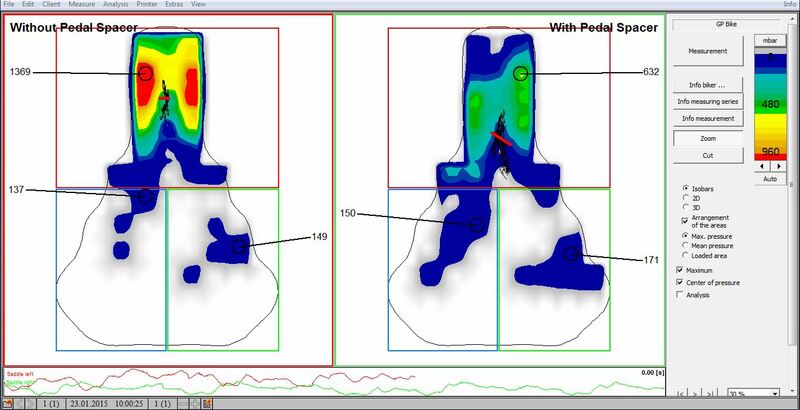 In addition, there was an improvement in the client’s saddle pressure map. The image below shows the saddle pressure before and after the pedal spacer was installed. Explained simply, it is possible to see that the high pressure areas (indicated in red and up to 1329 mbar) on the mid to front section of the saddle have significantly improved and the maximum pressure in that area is now reduced to 632 mbar. To ensure that the pressure data was not an isolated anomaly, data was captured an additional 3 times at various stages throughout the rest of the fit. The installation of a 20mm pedal spacer to achieve leg alignment is something of an unconventional approach. However, given Mr. Peake’s medical history, the technology and experience on offer at Elbow’s Akimbo has allowed a safe and effective solution to a difficult problem to be obtained.